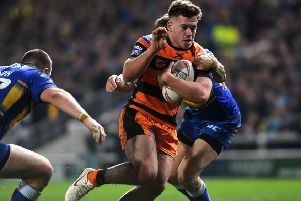 Three defeats in four matches have seen Castleford Tigers slip off the pace at the top of the Betfred Super League table, but there are no grounds for huge concern yet for head coach Daryl Powell who is backing his men to come good. While the Tigers boss is obviously unhappy at seeing his side suffer losses to Warrington, St Helens and Leeds in the last month he reckons that with a change of fortune injury-wise the team can still be right up there competing come the end of the season. When asked if he was concerned about the Tigers' results, Powell said: "Of course I am, I don't like losing one never mind three out of the last four, but it is what it is. "You have to deal with all sorts of scenarios as you work through a season and at the moment we're working through a tough period. "You've got to deal with wins and losses in the correct way and we'll find out on Friday where we're at. "There were some positives to take from the game at Leeds. "We tidied ourselves up in the second half and began to play like we'd spoken about before the game. "It's disappointing when you don't stick to plan and there's some lessons for us to learn there. "But we had people playing out of position in certain areas and that makes life tough. They were experienced players we had missing, international quality players. Some of the lessons we learned were ones of experience really. "But I think we'll be all right. The competition's a marathon not a sprint and I'm hoping we'll start to get a bit of luck down the track. "If we are able to select from our best team I think we're a formidable team, but that hasn't happened for us yet this season." Castleford lost out in their first golden point Super League game against Leeds, but Powell did not believe they were unlucky to be on the wrong end of the result, only having themselves to blame for not winning. He added: "We had a pretty average first half, but I thought we dominated the second half. "We had a missed goal kick then we kick a drop-goal and get penalised then miss one and decide not to take one on so there was not much luck about it. We should have won. "There were a number of lessons from the game and some harsh ones for individuals to take. "It was a disappointing loss. "If you take that one out of the equation we've only lost to Warrington and to St Helens and pretty much everyone's losing to them at the moment. They have had minimal injuries and they are flying. "That one last week rankled a little bit. It was an average performance and having got back from 20-4 to level we had more than enough opportunities to nail that game."